Right now, the prefix/override/suffix/title things, the "currently" field, and the description show up in tooltips, and there are tags in the tooltip for whether you have bio and meta tags defined, as well as a list of flags you've suggested. Basically, if you edit your data, and then click "save", your character will show that data to other players who run the addon. If you target someone, and they have data, there will be an "RP" button near their frame. You can move this with the slash command, if you don't like the default placement. /meri -B CENTER -X 25 -Y 60 => move button to +25 x, +60 y, from the center of the portrait bar. /meri -C <text> => set "currently" to the given text. The new -c/-s options allow you to change flags using a slash command, so you can create a macro that could, for instance, toggle your in-character state. Changing target with the window open will show the new target's data if the new target has data and you do not have unsaved data. 1. Use /meri -r. Set the flags you want people to have for you to RP with them, or that you want to exclude. Click "ENABLE" if it's not already clicked. You can also click the LFRP button on the main window. 3. Hit the ping button, get a list of people on that channel with the LFRP feature enabled who match your flags. Names will bring up their bios. LICENSING NOTE: I am too lazy to maintain listings for this addon on multiple sites, but do note that the license terms are intended to permit copying and derived works. In particular, I explicitly permit people to upload copies of this to other addon sites if they wish to. 0.6: Fix problem with checkboxes being unclickable. 0.6a: Meta/bio fields weren't displaying right locally. 0.7: Don't display previous character's data on login. 0.8: Remove typo accidentally introduced with 0.7. 0.9: Add version-checking; starting with 0.9, if you get RP data from someone with a newer version, you get notified (once the first time you see a given version, once per UI load). 0.10: Extra bulletproofing (I hope) against overwriting your data, though I've never reproduced it, update LibMerisioux to stop saving timeout information in savedvariables. 0.12: Internal updates, SL ToC stuff. 0.13: Found a case where the RP button would show up after you'd clicked off a target. Fixed. 0.15: Fix handling of enter key in text fields for 2.2's key event changes. 0.17: Major updates to address new event system, also improvements to the protocol to allow use of server-side storage. May be a little unreliable at first. 0.18: Update to slightly newer LibMerisioux, now restores server-side bio if it's newer than your local one, or you don't have a local one. 0.19: Add -b/-t options, update to pick up a new libgetopt for the new event model. 0.20: -BXY options to move buttons, age/height/weight fields, improved diagnostics, improved readability and display, made button smaller. 0.21: Fix focus and display bugs with new fields. 0.24: Slight layout tweaks, addition of gender/player-gender flags, clarification of "lore" checkbox, add -h (help) and -v (version) options. 0.27: LFRP debugging and improvements. 0.28: Custom field option (you can name the field yourself), and player notes. 0.29: Better handling of possible errors from the storage API. 0.30: update libdraggable, should no longer crash with recent Gadgets. In the game I was editting, I saved it. Went to view a target's merisioux and it didnt work. So i tried /meri -e, again and it didnt work? All commands work except for /meri and /meri -e. Ive deleted the addon and reinstalled it. Ive disabled the addon, hit apply, then re-enabled the addon, hit apply, and it still doesnt work. Please help, I love the add-on. Nobody else i've asked has had this issue. Edit: I have also tried clicking the UI "RP" button, which also brings no results. Last edited by Cicimo : 02-18-17 at 08:01 PM. How do I accomplish this with the completely remodeled button placement code? I messed with it for about 30 minutes, and I can't get the button or the 'RP' text to land in the same place. to get the button in the right position. Last edited by Stormbow : 08-11-13 at 12:21 PM. The Prefix, Override, and Suffix fields cannot be selected; clicking in Override will place the cursor in the Title field. There is no problem selecting the Flags or clicking the Description, Biography, and Meta Fields. I have tried reinstalling the addon, reloading the UI, restarting the game, but nothing has fixed the problem. Any suggestions would be appreciated. Heya, this may now be fixed. It was probably related to changes in how special keys (like tab) were handled. At least, I've been using it successfully more recently. Big RP fan and enjoy your work so far. I just wanted to bring to your attention a AddOn that I used back in my WoW days. It was called TotalRP. Its now on it's 2nd version and chock full of little RP goodies. Since you kinda have a monopoly on RP UIs at the moment, you should definitely take a look and see if you cant get some inspiration! I know the RP of Rift can be amazing and with your mod, it will make it even better! I look forward to following your work and seeing how you progress! Cheers! Hmm, it's working for me. To check, are you doing "/meri e" or "/meri -e"? The - is used for options; "/meri e" tries to show the data for a player named 'E'. I've installed the addon, it shows up in my list, and the edit window opens with the proper command, but everything in it is grayed out and unclickable, so I can't actually -use- the addon. Any idea what I've done wrong? So, frustrated, I decided to poke around a bit more, and it seems that /meri e only shows my RP info, but doesn't allow me to edit. However, targetting myself and clicking on the RP button by my portrait opens a window with fields I can actually change and type in. Just thought I'd post this for anyone having the same issue. That could be a bug introduced by my attempts to fix the reported edit problems, although I haven't encountered it. I'll try to have a look Real Soon. Last edited by Kaveri : 04-30-12 at 12:35 AM. Check the addons button on the character select screen and see whether it shows the addon; if it doesn't, it's not loaded for some reason. Assuming you're on Rift 1.8 (I am not sure whether all parts of the world are), it should show up if it's in the right directory. I followed the instructions to get the addon and what not, however, when I try to access it in game ti edit my info it says that the command to access it is invalid. Any idea on how to fix the issue so that I can edit info? If anyone who's been overwritten like that could get me the Interface/Saved/SavedVariables/LibMerisioux.lua file, that'd be super handy for looking at. I see what you mean. I didn't have my edit window up, when this occured, though. I wasn't aware it even happened, until someone nearby said my info had changed. I should note that I am using the latest version, though I think the other person was not. Boy, that's gonna be a heck of a lot of fun to track down. Last edited by Tethris : 04-25-12 at 08:16 PM. The first part (still showing previous character's description) is a known issue that should be fixed in current versions. Basically, it always showed the last information you saved, whether or not it was for this character. I haven't seen anything where it would override your data, though. In theory, if you have the editor up, and you have made no changes, when you target someone it'll switch to showing their info, but that shouldn't allow you to save; it should disable all the interface parts and just be a read-only display of their info. Hey! I'm really happy to see this project being worked on, though we need more people using it! I had a wierd issue with it today, though. One of my friends logged on their alt, and the alt was showing their main's information. So, she changed it and wrote stuff for her alt. Now, when I targetted her to read what she wrote, it changed MY information to match the information of her alt. My info was completely wiped out and replaced. I'm not sure why that happened, but thought I'd let you know! Character A has description, then logs on Character B. 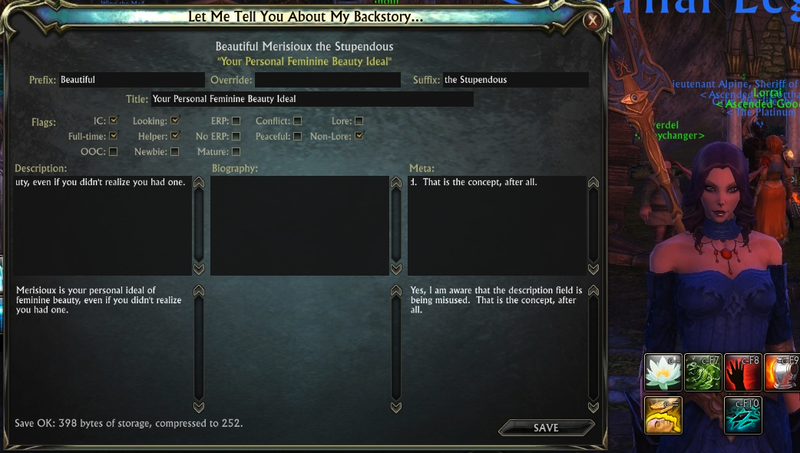 Character B logs in, but shows Character A's description. Character B sets information of her own. Character C (on a different computer and account) somehow inherits Character B's information, losing their own. Character A logs back on, and has Character B's information now too.